This class of cruise ship was planned as a inevitable consequence of the growth of the market and in order to satisfy the increasing passenger's expectations in the Royal Caribbean International's quality standard that the first trio of RCCL cruise ships could not still satisfy. The fifth of the series, named Enchantment of the Seas, carried out her first call in Barcelona last July 19th. This causally coincided with the Sundream's call, that was the first owned RCCL cruise ship after her delivery in 1970 as Song of Norway. The difference of size of both ships are a pattern of the cruise market development. The Enchantment of the Seas, built by the Finnish yard MASA, has a gross tonnage of 74,000, carries 1,958 passenger, with a crew of 760. She can transit the Panama Canal, and is designed to operate world wide. High quality materials were used throughout the ships (wood, marble, etc.) and there is not on board a hint of neon or glitter. Everywhere you go there are very tastefully decorated sitting areas with very confortable seating and views of the ocean, both inside and outside. The layout of the Enchantment of the Seas was designed by several notable naval architects: Njal R. Eide, Yran & Storbraaten, Robert Tillberg. She has an excellent planning and traffic patterns, with a wide variety of entertainment areas. There are on board 2,000 works of art representing an important contributor to the onboard elegance. On deck 4 there is the seven deck high atrium called Centrum which is the most spectacular space of the ship. This atrium is extraordinarily elegant and beautiful, with windows walls providing spectacular views. The main entrance on board is located here. Aft of the Centrum always on the deck four is the two level glass walled My Fair Lady main dining room, which seats 1,180 guest (two sittings) in 2, 4, 6 or 10 seat tables, and is equipped with a two deck high waterfall. The upper level leaves the center of the dining room uncovered giving this room a feeling of spaciousness. An informal restaurant, the Windjammer Caf», is located on Lido deck, where many passengers can have their breakfast and lunch. 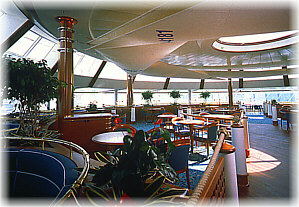 Also the Solarium Cafe' offers breakfast and lunch (on deck 9) when the Windjammer restaurant is closed. On the fifth deck is the Casino Royale, with a glass floor at one entrance, revealing coins and jewelry, 178 slots machines and a Las Vegas style artwork and decoration. It's the fun place of the ship. Forward on this deck is the two deck high Orpheum Theater show lounge (840 seats), which features perfect sound, ligth and sightlines in "cabaret" setting. 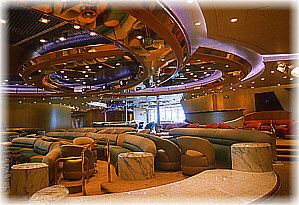 On deck six are aft the Carousel lounge, seating 470 passengers. There is a small stage here for an orchesta or other entertainment, and a dance floor, flanked by large windows aft, giving an open and roomy feeling. Forward this lounge are the Fascinating Rhythm midship lounge, a separate conference area and the Schooner bar. This is an informal pub, very nautical in decor, with authentic maritime art and rigging and ship model. The Schooner bar is a great place for a restful evening. Forward of the Centrun on this deck (6) are the Boutiques of the Centrum shopping area and the upper level of the Orpheum Theather. 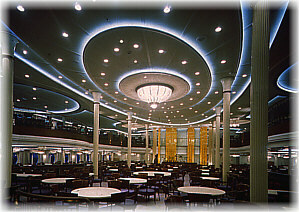 The seventh deck, in the starboard side of the Centrum, houses the ship library, and the Card Room. In the same positions, but one deck up, are located the Crown & Anchor Study and the Explorers Club. Deck eight also includes the wheel house, the radio room and the Royal Suite. As a true Royal Caribbean's liner, the Enchantment of the Seas has the trade mark Viking Crown Lounge atop the ship, though no longer attached to the funnel. It seats 250 in two levels, all dancing to the latest hi-tech music and lights in the evenings. This lounge can be reached using two glass elevators of the Centrum. There are on board 18 elevators (fast and efficient. ), included the two scenic installed in the Centrum. Deck nine is the ship's sun deck, which has two swimming pools. 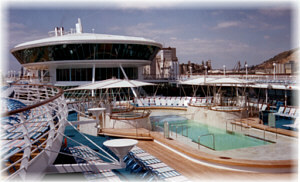 The open Main Pool Area is located amidship, forward of the Viking Crown Lounge and also houses four Jacuzzis. The Main Pool Area has a real wood decking and a stainless steel sculpture. Forward is the Windjammer Cafe', with two outside and one larger inside room, all with large windows with full ocean views. Between the funnel and the Viking Crown Lounge is located the Indian style Solarium, fitted with a fully retractable glass roof, called Crystal Canopy. The Solarium also houses two whirlpools and a bar with confortable seating and buffet service. The Solarium covered at night can be utilized as a dancing and entertainment area. Aft (below the funnel) is the two deck high Shipsape Center, which includes room for aerobics, a gymnasium, sauna, health club, etc. The partly open highest deck (10) houses forward the Teens center, the Kids center and the beautifull Observatory, where the planispheres indicate the location of constellations in the night sky. Thanks its windows the Observatory offers also a wonderful ocean view. Aft are the second level of the fitness center. The jogging track surround this deck, which also houses other sun bathing spaces. The Enchantment of the Seas carries only 1,958 passenger (lower berth capacity), houses the passenger accommodation on decks 2, 3, 4, 7 and 8, with a total of 975 cabins, availables for every taste and budget. There are 212 cabins having a veranda or balcony (with glass railings), and 576 outside cabins (all with picture windows). The outside cabin ratio is 59%. There are also a 96 square metre Royal suite, 5 owner suites (46 square metre) and 82 suites and minisuites. Fourteen cabins are handicapped-accesible, with wider doors, and the entire ship could be easily navigated by passengers in wheelchairs. The ship is fitted with a diesel-electric plant, with four diesel engines coupled to 15,300 KVA. The two 17 MW propulsion motors drive highly skewed propellers. A high 23,5 knots trial speed was reported, with 22 as service speed. Redundancy was sought by dividing key machinery areas into two sections configured for independent operation. Passenger confort at sea is enhanced by fin stabilisers. Recycling and waste sorting onboard is extensive. The ship is fitted with a dynamic positioning system which automatically steady her without anchors when she cannot docking. The Enchantment of the Seas actually carries out weekly cruises from Barcelona until August 30 alternating two itineraries: Palma de Mallorca, Marseilles, Livorno, Naples and Olbia (Sardinia) the first, or Villefranche, Ajaccio, Civitavecchia, Sicily and La Valetta (Malta) the second. Later, she accomplish a two week transatlantic crossing from Harwich to Boston (she will arrive September 20). Then, she is going to sail two 10-nigth New England cruises before repositioning to Miami to begin October 10, 3-night Bahamas short cruises from Miami to Miami. 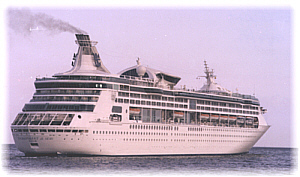 The Enchantment of the Seas is undoubtedly the better ship sailing the Mediterranean in this summer season. The privileged passenger that could enjoy it can find a big ship, but with intimacy, never crowded, where it is possible go for a walk, sit down to contemplate the sea, etc. She is decorated with European taste and offers many different atmospheres in order to satisfy a wide spectrum of passengers. The cabins are plenty of space, well appointed and equipped, the crew is numerous and attentive and everything onboard is the consequence of more than 25 years of RCCL's experience.